During the Second Vatican Council and for many years thereafter, the universal church experienced a joyful confidence in the Spirit. “The People of God believes that it is led by the Spirit of the Lord who fills the earth,” wrote the world’s bishops in 1965 in the “Pastoral Constitution on the Church in the Modern World” (No. 11). Some critics have dismissed the council, and particularly the postconciliar work of justice and peace, as the fruit of a shallow, this-worldly optimism. Yet Pope Paul VI saw it as the work of the Spirit, a power experienced throughout the whole church that fostered its engagement with the world. “We live in the Church at a privileged moment of the Spirit. Everywhere people are trying to know him better...happy to place themselves under his inspiration...for it is he who causes people to discern the signs of the times—signs willed by God—which evangelization reveals and puts to use within history,” Paul wrote a decade after the council in “Evangelization in the Modern World” (No. 75). Yet the Spirit is a disruptive, purifying power, especially when it inspires us with new work to do, sometimes work never even imagined before. Advocacy for human rights and peacemaking are just two of the new works the Spirit has led the church to undertake. Others include economic justice, the pro-life movement, ecological responsibility and religious freedom. In Pope Paul’s eyes the church was not deluded to take up these labors, for the Spirit of the risen Christ is behind them. The council took steps to re-imagine and re-organize the church for service of the world. In the “Dogmatic Constitution on the Church,” the council appealed to a variety of biblical images to elucidate the mystery of the church. In the field of social ministry, the key image was that of the servant church. The whole of Chapter 4 of the first part of the “Pastoral Constitution on the Church in the Modern World” is dedicated to the mutual service the church and the world offer one another. The church, it explains, “serves as a leaven and a kind of soul for human society as it is to be renewed in Christ and transformed into God’s family” (Nos. 40-44). She serves individuals by affirming the dignity and autonomy of persons and proclaiming “the rights of man.” She serves society by affirming and promoting wholesome “socialization” and the promotion of unity in the human family. She serves human activity through the faith-filled activity of laypeople in their secular roles, in allowing legitimate diversity to the faithful in responding to the Gospel, and, notably, in struggling against those defects in the visible church that impede the spread of the Gospel. Finally, the constitution commends all Christians to work for the good of humanity. “Let us take pains,” it urges, “to pattern ourselves after the Gospel more exactly every day, and thus work as brothers in rendering service to the human family. For in Christ Jesus this family is called into the family of the [children] of God” (No. 90). So while servant ecclesiology may still require fuller elaboration by both theologians and the magisterium, it nonetheless stands as the foundation for the integration of the social mission into the full life of the church. In “Christus Dominus” the council fathers expanded the teaching role of every bishop to include “public witness on matters of justice and peace” (No. 12) and established episcopal conferences, enabling the bishops to offer common witness at national and regional levels. As social ministry became a global enterprise, the church established the Pontifical Council for Justice and Peace (as it came to be called), which sets up networks between local churches in the developing world and those in the developed world, and of both with international organizations. In the 1990s, for example, in an effort to reduce the crippling debt burden of impoverished countries, the organization convened conversations between the Latin American Episcopal Conference and the U.S. Catholic Conference with the World Bank and the International Monetary Fund. Subsequently, the church has enhanced its capacity for social mission by transforming its relief agencies (the members of Caritas Internationalis, like Catholic Relief Services, Cafod and Secours Catholique) into agents of justice and peace. In the late 1960s and ’70s these agencies added development to their traditional relief work, empowering people to help themselves. During the ’80s and early ’90s they learned that development would be stymied without advocacy for justice; and as the 20th century turned into the 21st, they understood that peacemaking was necessary for building just and prosperous communities. This organizational structure makes the church a potent agent for social change. The council fathers also expanded their concept of the household of God to include ecumenical ties to those “not yet living in full communion” and urged Catholics to collaborate on social ministry with their “separated brethren” (“Church in the Modern World,” No. 90). Fifty years later, shared social ministry has become a standard expression of the ecumenical character of the church of Christ. And on issues from climate change to Middle East peace, joint advocacy and service programs between Catholics and other Christians, as well as interfaith programs with Jewish and Muslim partners, are so common we take them for granted. After the council, advocacy of human rights was the first impulse of the Spirit within the church’s social mission. But its origins lay in an earlier major initiative of Blessed John XXIII, the 1963 encyclical “Peace on Earth.” The most remarkable thing about the encyclical, which was born out of the Cuban missile crisis, is that it does not deal extensively with conflict, armed force, just war theory or negotiation (typical issues of peacemaking). Instead it elaborates a theology of political life founded on human rights. A political theology rooted in the rights of the human person was in itself a revolutionary development. For until then Catholic political theory rested mostly on the natural law and its corollary duties. Pope John’s encyclical redefined the common good in terms of the establishment, defense and safeguarding of human rights. It made upholding human rights the goal of all political authority, conditioned the legitimacy of government decisions on the service of those rights and defined peace as a situation in which the rights of persons are upheld. Within a few years, the church itself became a major actor in the human rights movement. The Justice and Peace Commission, founded in 1968, publicized the church’s teaching on human rights, then elaborated and applied it in a series of special papers issued in connection with United Nations special assemblies (like those on racism and homelessness) and meetings of the World Trade Organization. Beginning in 1973, with the establishment in Chile of the Vicariate of Solidarity following the overthrow of President Salvador Allende, the church there modeled effective witness on behalf of human rights under autocratic rule. One of the vicariate’s executive directors, José “Pepe” Zalaquett, later became president of Amnesty International. In the coming decades, church-based human rights offices opened in many countries. Of special importance during the dirty wars in Central America in the ’80s and ’90s were Tutela Legal in El Salvador, the Archdiocesan Human Rights Office in Guatemala City, and the Bartolomé de las Casas and Miguel Pro Centers in Mexico. While defending labor rights, the Solidarity movement in Poland, with the spiritual guidance of Blessed John Paul II, became a bellwether of political emancipation in Eastern Europe. The defense of human rights has also been an ecumenical and interreligious undertaking. In the early ’90s when the U.S.C.C. undertook a campaign for religious liberty in China and sought guidance from the Vatican, the single instruction the conference received from the Holy See was to advocate for liberty for all (not just for Catholics, but for Muslim Uighurs, Tibetan Buddhists and house-church evangelicals as well). During the breakup of the former Yugoslavia, Cardinal Franjo Kuhari?, the archbishop of Zagreb, Croatia, defended the rights of Serbs and Muslims as well as of his fellow Croatians. In Jerusalem, when Patriarch Michel Sabbah made the case for justice for his fellow Palestinian Christians, he pled as well for the rights of Israeli Jews and Palestinian Muslims. The common witness of the churches, religions and people of good will does build up the unity of the human family and contribute to peace, as Pope John envisioned. In the last decades of the 20th century, many leaders of human rights movements around the world were Catholics. They included laypeople, like Kim Dae Jung in South Korea, Corazon Aquino in the Philippines and Mairead Corrigan Maguire in Northern Ireland; and bishops, like Franjo Komarica in Bosnia, Michel Sabbah in the Holy Land, Samuel Ruiz in Mexico and Filipe Ximenes Belo in East Timor. Catholic peace activists were heartened by the council’s call to “undertake an evaluation of war with an entirely new attitude” and the declaration that “the arms race is an utterly treacherous trap for humanity.” But the fathers ceded governments “the right to legitimate defense” and recognized military personnel “as agents of security and freedom” (“Church in the Modern World,” Nos. 80-81). In subsequent decades the Holy See has worked to curb the arms trade, especially small arms and landmines, work that resulted in an international treaty. Nuclear War and Deterrence. In Catholic peacemaking the first major postconciliar development came during the 1980s debate over nuclear war. The drafting of a peace pastoral by the U.S. Catholic bishops prompted similar letters by European bishops’ conferences. There was agreement on prohibiting the use of nuclear weapons, but the conferences expressed a range of opinions on nuclear deterrence. The Vatican brought American and European bishops together to talk out their differences, and Pope John Paul II settled the deterrence issue with a message to the United Nations in 1982; he argued that “deterrence...as a step on the way toward disarmament may still be judged as morally acceptable.” Since then the abolition of nuclear weapons has become a policy goal for both the Holy See and the U.S.C.C.B. Nonviolence and R2P.Beginning with the collapse of Communism in Eastern Europe in 1989, further developments helped to re-order the position of the just war tradition in church teaching: increasing endorsements of nonviolence, appeals for humanitarian intervention and the United Nations’ adoption of the Responsibility to Protect. In 1991, in the encyclical “Centesimus Annus,” Blessed John Paul II praised the nonviolent activists who had defeated the Communist regimes in Eastern Europe. He expressed a hope that nonviolence would become the rule in domestic and international confrontations. 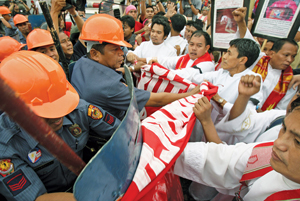 Two years later the U.S. bishops declared that nonviolence should be the primary Christian response to conflict, with just war as a back-up when repeated attempts at nonviolent resistance have failed. The Holy See led the diplomatic world in responding to calls for humanitarian intervention in the Balkans, Rwanda, Central Africa and East Timor. In a surprising transformation in the international order, the United Nations explored what it called “the responsibility to protect.” At a meeting of world leaders on the U.N.’s 50th anniversary, it made R2P a principle of international law. In 2008, when Pope Benedict XVI addressed the General Assembly, he voiced the church’s strong support for the principle. Along with nonviolence, R2P seems to have displaced just war as the church’s ordinary mode of discourse in times of conflict. Catholic Peacebuilding. The conflicts in the Balkans and Central Africa also led to an enormous growth of specialized groups (nongovernmental, governmental and intergovernmental) to carry out conflict prevention, resolution and recovery. The church has contributed to this growth. In part, the situations of bishops as leaders in societies without other institutions, so-called failed states, led dozens of them, like Cardinal Laurent Monsengwo in Congo and the late-Cardinal Rodolfo Quezada Toruño in Guatemala, to become mediators and national conciliators. Catholic relief and refugee agencies and the Caritas Internationalis network have supported mediation and reconciliation efforts in places as diverse as Burundi, Colombia and the Philippines. Now the Catholic Peacebuilding Network is attempting to coordinate these efforts, share expertise and extend peacemaking initiatives into zones of conflict. The network owes its origin to ecumenical collaboration between the Mennonite conflict-transformation expert John Paul Lederach, Catholic Relief Services and the Kroc Institute for International Peace Studies at the University of Notre Dame. The growth in constructive Catholic peacemaking shows the church making good on her teaching that “peace is more than the absence of war” (“Church in the Modern World,” No. 78). This article also appeared in print, under the headline "Impulses of the Spirit," in the October 8, 2012 issue. Drew Christiansen, S.J., is editor in chief ofAmerica. He was director of the U.S. Catholic Conference Office of International Justice and Peace from 1991 to 1998 and its counselor for international affairs from 1998 to 2004. This article is an edited excerpt from a lecture delivered at the Atonement Friars’ Centro Pro Unione in Rome during the Week of Prayer for Christian Unity in January 2012.